The purpose of this module series is to give evaluators a step-by-step approach to how to assess and evaluate a preschool-age child, based on current federal law, state regulations, ASHA guidelines, and evidence-based practice. 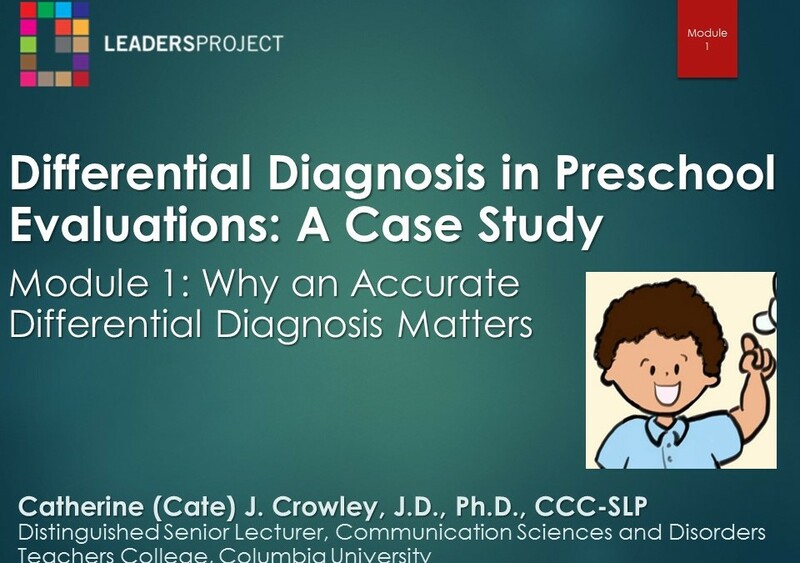 Dr. Cate Crowley discusses the full process of using clinical judgement to come up with a differential diagnosis for a child. Click for Details: This language elicitation card and questions were designed as a tool to be used in assessing language for preschool and elementary school aged children. Developed by Cate Crowley and Miriam Baigorri. Illustrated by Tina Yeung. Click for Details: This set of language elicitation cards and questions was designed as a tool to be used in assessing language for preschool and elementary school aged children. Developed by Cate Crowley and Miriam Baigorri. Illustrated by Tina Yeung. Dollaghan, C., & Campbell, T. F. (1998). Nonword repetition and child language impairment. Journal of Speech, Language, and Hearing Research, 41(5), 1136-1146. Paradis, J. (2005). Grammatical morphology in children learning English as a second language: Implications of similarities with specific language impairment. Language, Speech, and Hearing Services in Schools, 36(3), 172-187. Peña, E. D., & Quinn, R. (1997). Task familiarity: Effects on the test performance of Puerto Rican and African American Children. Language, Speech, and Hearing Services in Schools, 28, 323-332.